Summary: This is a story of teenage rebellion and addiction, and a mother’s attempts to help her despite fighting her own demons and limitations. The story takes you through five years of rebellion, a mother’s denial, her allowance of her sixteen- year-old daughter having a live-in lover, her insistence of abortion when she got pregnant, and birth control implants, so that nothing would interfere with her daughter’s education. It’s also a story about the dynamics between mother and daughter, a mother’s bad choices and unsuccessful attempts to reach her daughter, including sending her to live with relatives at sixteen and the daughter’s feeling of being unloved resulting in her acting out. Ultimately, things settle down, Morgan completes high school and graduates with a degree in philosophy from the University of California, Santa Cruz. 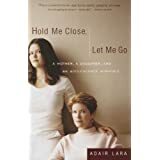 Reviews: “Lara’s memoir is in equal parts disturbing and absorbing, primarily because of her ability to acknowledge—and ultimately accept responsibility for—her initial eagerness to deny that her daughter’s life was going awry. Her yarn is told from the heart.” –New York Newsday. Lara is an award-winning newspaper columnist and author of a dozen books. She has had articles and essays published in Redbook, Ladies’ Home Journal, Parenting, Good Housekeeping, Reader’s Digest and others. She lives in San Francisco. *1990: Associated Press, Best Columnist in California. *1998: First place, general interest columns, National Society of Newspaper Columnists. *1999: Second place, commentary, American Association of Sunday and Feature editors contest, competing against papers with circulation over 300,000. The therapeutic potential is that applying the principles of tough love, when everything inside you wants to give in to the addict’s manipulations and threats, only then is there hope to making necessary, life-saving, positive and lasting changes. Adair writes from personal experience as a mother —what worked and what did not work to help her daughter. She speaks frankly about her own demons and limitations. Her credibility came from her honesty about herself, her family, and their connection to and what they learned from AA and Al-Anon. This book could have a wide range of audience from parents of addicts, to family members and the curious.